Firefighters from Blue Watch at Kingswood Fire Station joined an assembly at Park Primary School today (Thursday 17 November) to give a talk about the importance of fire safety in the home and to thank the children for completing their home fire safety project. Avon Fire & Rescue Service (AF&RS) is supporting the national Fire Kills campaign by encouraging local school children and their families to test their smoke alarms this November. Children from Park Primary School in Kingswood brought home a letter asking parents and guardians to work with their child to ensure their home is safe from fire by checking the smoke alarm batteries and completing the home fire safety survey. Smoke alarms provide a warning that fire has broken out and could give occupants of a house vital extra minutes to escape, especially at night. Between April 2015 and March 2016 AF&RS attended 539 house fires. There was no smoke alarm fitted in 185 (34%) of these, however this has improved by 7% compared with last year where 41% of homes had no smoke alarm. AF&RS Group Manager for Risk Reduction, Matt Peskett, said: “Kingswood firefighters were delighted to join in the school assembly and thank the children for completing their home fire safety project. AF&RS offers free Home Fire Safety Visits where our staff provide fire safety advice and fit free smoke alarms if required. 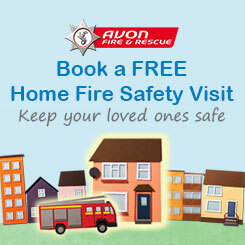 To book a Home Fire Safety Visit for yourself or someone you care about visit www.avonfire.gov.uk, call 0117 926 2061 or text VISIT to 07507 319 694. Avon Fire & Rescue Service (AF&RS) has also been urging families to join an online campaign encouraging people to test their smoke alarm. AF&RS is asking families to show their support for the #PressToTest campaign by posting images online of themselves checking their detectors. Families who post an image will have one of four chances to win a visit to a fire station.